Turn your company car, truck or van into a head turning, attention-grabbing rolling billboard with a full vehicle wrap. 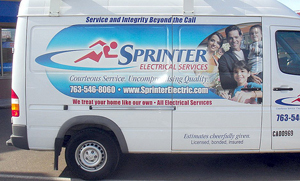 We can wrap your entire vehicle with a custom, full-color graphic design or photo image that will be sure to generate leads. Today’s vehicle wraps are something you have to see to truly enjoy. So give us a call, and we’ll show you what we can do.